Sharon McDonald wrote a great blog about guiding a girl-led Daisy Troop at an age appropriate level. 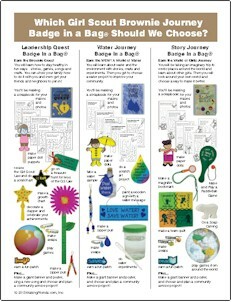 Expanding on that, we’d like to share some ideas for a girl-led Girl Scout Brownie Journey using our Badge in a Bags©. First, don’t select the journey for them. We’ve made a printable flyer to hand out to your Brownie troop. Read over the general descriptions on the flyer with them. Try to get a discussion going. Anyone want to go on a treasure hunt? Tell the girls that the Brownie Quest includes a treasure hunt for keys. What about fun water experiments like making a rainbow? That would be the Wonders of Water Journey. Or maybe they would rather go on an imaginary trip around the world? Then they would like the World of Girls Journey. Give the girls a chance to look over the projects that are included with each kit. You can ask the girls to circle the activities that look like the most fun to them. Take a troop consensus to decide which Journey to choose. At the Brownie level, Girl Scouts should also have input with the troop budget. Discuss how much money is in their account and how much the Badge in a Bag® kit will cost (about $12 per girl depending upon the number of girls.) Do they want to cover the cost with dues (the journey takes six meetings and $2 per girl/per meeting). There is also the cost of the awards to consider. You will not need purchase the leader’s guide but you will need one girl’s book for the troop to share. A good suggestion came from one of our Facebook leaders. She gives each girl an opportunity to lead part of the journey with help from a parent. Another option, with the Badge in a Bag© Journey kit, you can give each girl one of the included activities to lead during the journey. Guiding the girls into choosing a suitable TAP project is also easy with our Badge in a Bags©. Each Brownie Journey kit includes six maze worksheets each picturing a TAP idea. When you start to discuss the TAP project with the girls, ask them to refer back to their maze pages for some ideas and help them to start expanding upon those. Also included in our kit is a graphical organizer poster. As a troop, the girls can identify areas in their community and explore ideas to make improvements. With our Badge in Bag® Journey kit, a girl-led Brownie troop is easier than you think, cost-effective and will provide you and your girls with a memorable experience in Girl Scouting. 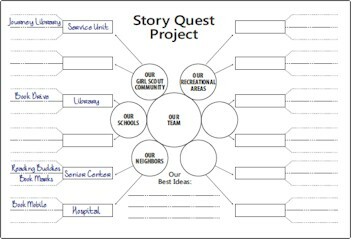 Hello, I was wanting to know how I can get the sheet that tells all about the journeys for the Brownie Girl Scouts? I really don’t want to buy a kit until the girls have decided on what journey they want to do. Can you please help me with this?